So I woke up around 10 this morning after a late night with Keith, Varian, Adrian, all the other fabulous TAB employees, some champagne, a mango margarita, and some bacon wrapped dates. I had a date with Dora and Debra, two sisters from Singapore I met at TAB on Thursday night who graciously offered to take me to chinatown. We met at the MTA station in Little India. Man - public transport rocks... if Los Angeles wasn't like 40 billion square miles we might have a chance at devising a system so convenient and wonderful. First stop - Vietnamese foodings. I had rice noodles with crisp salad, fried spring roll, and bbq pork... it was delish. I also had a watermelon juice (which is totally omg by the way). Luckily I had the luxury of not drinking it out of a plastic bag this time around, but I was thankful for the previous experience of doing so because it's kinda a rite of passage; sorta like the Hamar tribe in Ethiopia makes their boys jump over a cow four times before they are considered manly enough to marry... except less deadly, and less naked. Chinatown was vibrant, bustling, and filled with all stereotypical trappings like dried bloated toads and jars filled with centipedes and hootch that supposedly give you special voodoo powers or something. 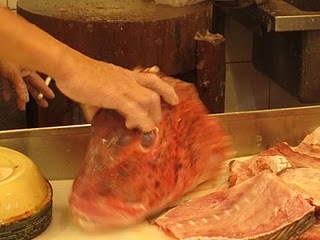 We visited the wet market and saw all the cute turtles and froggies waiting patiently to go to their new homes... and a giant fish head... and lots of other slimy creatures and whatnot. Then, we shopped. 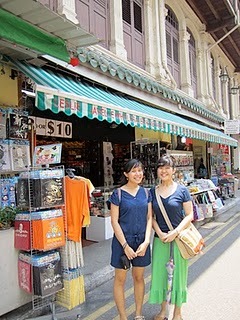 It was awfully handy having two chinese speaking ladies representing me as a buyer. I hate bargaining almost as much as I hate musicals... and believe me, I friggen' hate musicals. Then, the climax of the whole trip. 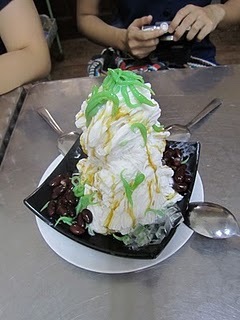 Some coconut/brown sugar syrup/grass jelly/red bean/chewy green thingee/ice cream/shaved ice dessert. Sorry ladies, I already forgot the name of it. This thing will forever live in my mind as one of the single most delicious treats I've ever experienced. Which is saying a lot because I'm basically a "lady of the night" when it comes to dessert... I don't really know how this metaphor works, the details aren't important, basically what I'm saying is that it totally rocked. Afterwards we got on a bus and headed for the "little children's museum", which is basically a place where someone has put together all sorts of fun childhood memorabilia. You can go there and see all sorts of toys and baby products from as early as the 40's. Did you know that baby bottles used to be made out of actual glass?? Yikes. 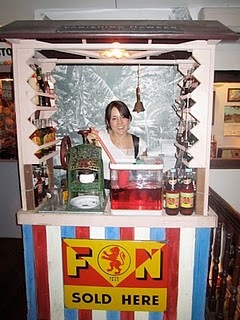 I posed behind a shave ice stand, and at a vintage children's desk filled with old textbooks. Then we took a taxi back to my place, and now I'm blogging about it... except that by the time you read this part I will be done blogging... or maybe I won't be... or maybe I'll be writing a new blog, or maybe I'll be an old woman trapped in a world filled with half alien - half cyborg zombies. Who knows what the future holds!!!! Thanks for the day Ladies! !